Preheat oven to 350°F. Line a 9x13 pan with heavy aluminum foil and spray with cooking spray. Mix brownie mix, eggs, and oil according to brownie directions.Bake brownies according to package directions. Let cool. Melt 1 cup of the chocolate chips and let cool slightly. In a mixing bowl, beat the cream cheese until fluffy; add the powdered sugar, almond extract, and raspberry jam; mix well. Stir in the melted chocolate and mix until combined. Spread the filling evenly over the cooled brownies and chill in the refrigerator. For the glaze, melt remaining 1/4 cup chocolate chips and shortening in the microwave in 30 seconds intervals or until melted. Mix well. 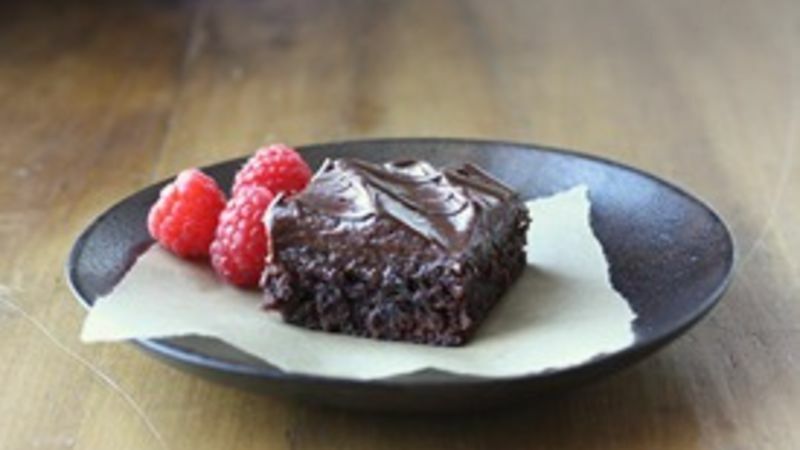 Drizzle glaze over chilled brownies with a fork. Keep chilled until serving and then garnish with raspberries.